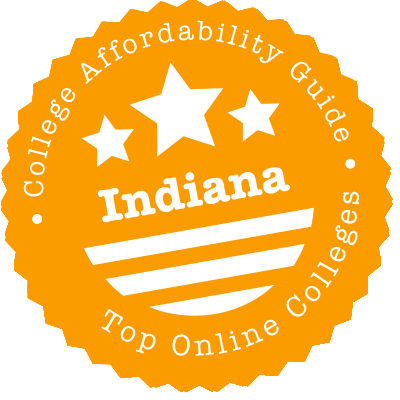 Scroll down to see the top not-for-profit colleges and universities in Indiana offering online degree programs. With more than 1,000 courses online, Ivy Tech Community College has many options for students seeking the convenience of an online education. More than 15 programs are online, with the most flexibility provided by the General Education Transfer Core or Associate of General Studies. The Transfer Core covers required general education courses and transfers as a block of 30 credits to six Indiana state colleges, including Purdue and Ball State. Many of the online programs provide students with skills they can use on the job now or prepare them to transfer to a four-year school. Ivy Tech is one of the few two-year colleges to be an NSA Center for Cyber Security Education, and cyber security programs are available online. Indiana Tech started nearly 100 years ago as an engineering school, but it has broadened its mission and now offers career-focused education in several fields, although engineering and business account for more than half of students. Online programs range from associate degrees to a Ph.D. in Global Leadership. Close to half of the online programs are housed in the College of Business, including MBA programs in fields such as accounting, health care management, and human resources. The College of Engineering, on the other hand, offers only two online programs, both master's in engineering management. The College of General Studies houses many online undergraduate programs, including criminal justice, child development, and emergency response management. Ball State University offers several online and blended degree programs at the undergraduate and graduate level. The University offers an online Associate in Arts degree in general arts and a blended Associate in Science in Radiography degree. Fully online bachelor's degrees are offered in business administration, criminal justice and criminology, early childhood education, general studies and nursing. Online undergraduate certificates are available in apartment management, corrections, emerging media journalism and infant/toddler specialization. Online master's degrees are available in more than 20 subjects, including adult and community education, applied behavior analysis with an emphasis in autism, business administration, business and marketing education, career and technical education, coaching education, curriculum and educational technology, educational administration and supervision, educational psychology, elementary education, executive development, interior design, journalism, mathematics education, nursing, public relations, quantitative psychology, secondary education, special education and technology education. Some of these programs have on-campus requirements, like the M.A. in Special Education, which requires students in certain specializations to take both online and face-to-face courses. Ball State also offers an online Doctor of Nursing Practice degree and blended Doctor of Education in Adult, Higher and Community Education and Doctor of Education in Educational Administration and Supervision degrees. Online students at BSU are eligible for state and federal financial aid. Indiana University Bloomington offers over 100 online degree and certificate programs. Online undergraduate degree completion programs are available in business administration, communication studies, criminal justice, English, technical and professional writing, mathematics, natural science and mathematics, nursing, political science and psychology. Other online undergraduate options include associate degrees in labor studies and histotechnology and bachelor's degrees in general studies, health information management, health sciences and labor studies. Online master's degrees are available in subjects such as adult education, business administration, business analytics, data science, educational leadership, entrepreneurship and innovation, finance, global supply chain management, health sciences, instructional systems technology, library science, marketing, music technology, music therapy, nursing education, nutrition and dietetics, park and public lands management, public affairs, recreational therapy, social work, special education, strategic management and technology. Additionally, IU offers online doctoral degrees in instructional systems technology, nursing practice and nursing science, as well as over 25 online undergraduate certificates and over 25 online graduate certificates. Hundreds of individual online courses are also available. Students enrolled in online courses at Indiana University are eligible for the same types of financial aid as on-campus students. Indiana State University has more than 70 programs that can be completed online, at all levels from bachelor's degrees to doctorates. About 20 bachelor degrees are available, with many in the fields of IT and business. The university is able to offer so many undergraduate majors by assuring the major subject courses needed are offered online, but allowing students to take courses to meet Foundational Studies requirements at a local college and transfer the credits if a needed course is not offered online. All the courses for master's degrees, educational specialist, and doctoral degrees are available online, and most programs do not require students to spend any time on campus. Indiana University-Purdue University-Indianapolis offers hundreds of online and hybrid courses, as well as many online undergraduate and graduate degree programs. Online bachelor's degrees include a B.A.S. in Applied Science, a B.S. in Business Administration, B.A. and B.S. degrees in communication studies, a B.S. in Criminal Justice, a B.A. in English, Technical and Professional Writing, a Bachelor of General Studies, a B.S. in Health Information Management, a B.S. in Health Sciences, an A.S. in Histotechnology, an A.S. and a B.S in Labor Studies, a B.S. in Mathematics, a B.A. in Natural Science and Mathematics, a B.S. in Mathematics, a Bachelor of Science in Nursing, a B.S. in Political Science and a B.S. in Psychology. Online master's degrees include an M.S. in Adult Education, an M.B.A., an M.S. in Business Analytics, an M.S. in Data Science, an M.S.Ed. in Educational Leadership, an M.S. in Entrepreneurship and Innovation, an M.S. in Finance, an M.S. in Health Sciences, a Master of Library Science, an M.S. in Marketing, an M.S. in Music Therapy, a Master of Nursing Education, an M.S. in Nutrition and Dietetics, a Master of Public Affairs, a Master of Social Work, an M.S.Ed. in Special Education and an M.S. in Strategic Management. Online courses at Indiana University-Purdue University-Indianapolis are eligible for the same types of financial aid as on-campus courses. Purdue University offers 19 Master's degrees entirely online including an M.S./M.B.A. in Agricultural Economics, a dual Master of Science-Master of Business Administration, a Master of Science in Building Construction Management, a Master of Science in Aeronautics and Astronautics, a Master of Science in Communication, a Master of Science in Economics, a Master of Science in Education in Special Education, a Master of Science in Engineering - Interdisciplinary, a Master of Science in Global Supply Chain Management, a Master of Science in Information Technology Project Management, and more. They also offer many graduate certificates. All degree seeking students--online students included--may be eligible for loans, grants, and scholarships. While courses do have deadlines and exam dates, students are able to log in whenever it is convenient to complete coursework. Many programs offer virtual open houses for students to become oriented with the online learning process. Classes begin in January, May, June, and August. Indiana University-East offers online undergraduate degree completion programs in business administration, communication studies, criminal justice, English, technical and professional writing, general studies, mathematics, natural science and mathematics with a concentration in mathematics, nursing (R.N. to B.S.N. ), political science and psychology, as well as online graduate certificates in composition studies, early childhood teaching, mathematics, and online instruction and assessment. Students who have completed an Associate of Applied Science degree can also enroll in an online Bachelor of Applied Science degree completion program, which includes a health care track and an individualized track. All of the undergraduate degree completion programs are offered entirely online and are designed for students who have already completed at least 60 transferable credit hours of coursework, including Indiana University East core curriculum and all required prerequisites. Online students at Indiana University-East are eligible for financial aid in the form of federal loans and grants. Although it's a four-year university, Vincennes puts mostly associate degrees online. The biggest offerings are the AA in Behavioral Sciences, which comes with a pair of optional concentrations. Students can take it as an Associate of Science transfer degree, if they wish. Such transfer degrees are also available in eight other disciplines, running the gamut from the vanilla AS in General Studies to the specialized AS in Family and Consumer Sciences. All of the school's shorter online certificate programs connect to online associate programs. At the baccalaureate level, the school offers three Bachelor of Science degrees: Homeland Security and Public Safety, Nursing (RN to BSN), and Technology. The latter comes in several concentrations, covering agribusiness, industry and IT. Indiana University Southeast has an online degree-completion program that allows working nurses who have an Associate of Science in Nursing or a diploma in nursing to earn their Bachelor of Science in Nursing. Students who have already completed all of their general education requirements have the option of taking the program on a timetable that will allow them to graduate in 12, 18, or 24 months. The curriculum includes nine required courses and two electives selected from a list of acceptable courses. Students may be able to receive academic credit for prior learning or skills through a portfolio assessment process, and many of the academic activities can be performed as part of the student's current professional duties. IUS, which has programs leading to more than 50 undergraduate and graduate degrees and certificates, offers some online classes for programs other than nursing, but students cannot complete those programs entirely online. Indiana University Northwest offers a variety of graduate and undergraduate programs in an online environment. The Bachelor of Applied Science is an interdisciplinary degree-completion program for students who have already earned an associate degree. The flexible program allows students to choose a track in health management or to create their own interdisciplinary track. The online Bachelor of Science in Health Information Administration prepares students to take the exam to become a Registered Health Information Administrator. The labor studies program offers a certificate and associate and bachelor's degree online. The RN to BSN program offers students options to complete the program in 12, 18, or 24 months, with classes delivered in eight-week sessions. Certified educators can enroll in a five-course, 15-credit Graduate Certificate in K-12 Online Teaching that is delivered 100 percent online with each course running for about eight weeks. As part of the program, teachers develop their own online class. IUN lists four online programs as being in a hybrid format: Bachelor of Science in Computer Information Systems, Bachelor of Science in Philosophy, Bachelor of Science in Political Science, and Associate of Science in History. The university's online RN-BSN baccalaureate program can be completed in as little as 12 months (full time) or 24 months (part-time). There are five graduate degrees that can be pursued online. These are: Master of Business Administration, MBA in Sustainability, Master of Healthcare Administration, Master of Organizational Leadership, and Master of Environmental Health. The University of Saint Francis offers their online adult and graduate programs at a lower cost than their current tuition rates. Qualified students may still be eligible for financial assistance as they pursue their online degrees. Indiana University South Bend offers a fully online RN to BSN degree-completion program. All eight of IU's nursing programs statewide worked together to develop the program, which students can complete in 12 months of full-time study or 18 to 24 months as a part-time student after they have completed general education requirements. Classes in the program are presented in seven- to eight-week modules, allowing students to take up to four classes in a traditional 16-week semester. Clinical experiences and practicum activities can be tailored to the individual student's career needs or experience. Students can also receive credit for previous work experience or completed coursework that meets the desired outcomes of a particular course. IU offers a variety of scholarships for students in the online RN to BSN program. The only other degree available online through IUSB is the Bachelor of Applied Science, a degree completion program open to students who have an Associate of Applied Science degree from a community college. The university offers some online classes for traditional, campus-based degree programs. Oakland City University (OCU) supports a generous transfer program that allows online students to transfer up to twice the number of credits accepted at other institutions. Students can also apply for credit to be given for relevant previous work experience. Online classes typically follow a five week schedule, which makes completing a program faster and more economical. At the current time, OCU offers Associate of Arts (AA) degrees in two areas - general studies and religious studies. There are also two Bachelor of Applied Science (BAS) degrees available: BAS in Operations Management and BAS in Business Administration. Students pursuing the BAS in Operations Management degree can choose from three areas of concentration: quality systems, logistics and products distribution, and criminal justice. Bachelor of Science programs are available online in the fields of business administration and criminal justice. OCU offers online programs on the graduate level as well. These include the following degrees: Master of Science in Strategic Management (M.S.S.M. ), Master of Business Administration (M.B.A.), Doctor of Education (Ed.D. ), and Education Specialist (Ed.S.). The M.B.A. program offers a healthcare management specialization and can be completed in just 18 months. The Ed.D. program has three areas of specialization: superintendency, curriculum and instruction, and organizational management. Taylor University offers its online classes in an unusual, independent study format. Students work one-on-one with the instructor, and they have four months to complete the program from the day they select to pay tuition. However, students who are receiving financial aid must complete the classes on a 15-week semester schedule due to federal regulations. All coursework is self-paced and asynchronous. Taylor's online options include three associate degrees and a Transition to Teaching program designed for graduate students who earned a bachelor's degree from an accredited college and who to become a licensed teacher. Students can take an 18-credit program if they want a secondary school license or a 24-credit program for an elementary school license. The associate degree programs lead to an Associate of Arts in Biblical Studies, A.A. in Human Services, or A.A. in Professional Writing. The college also has online programs leading to a professional writing certificate and add-on teacher licensure in Exceptional Children: Mild Intervention. Marian University in Indianapolis offers online programs in nursing and paralegal studies. Career changers who want to become nurses can speed the process at Marian, which offers accelerated, online classes in prerequisite courses for adults who want to enter a career in nursing when they have a college degree in another field. The courses are offered in a five-week or eight-week format and start 12 times a year. Classes offered include anatomy, chemistry, microbiology, statistics, physiology, and human growth and development. The university partners with the Saint Thomas Health and Saint Vincent Health systems, which are the sites for clinical rotations students will perform while earning their Bachelor of Science in Nursing in accelerated, online classes. Students can complete the program in about 16 months. Working nurses who wish to finish work towards a Bachelor of Science in Nursing can earn their BSN in as few as 16 months through Marian's online RN to BSN program. Students interested in the law can earn a paralegal certificate or Associate in Science in Paralegal Studies online. Paralegal students have the option of internships, externships, and job shadowing to gain skills. Adjunct faculty include local attorneys and paralegals. Indiana University Kokomo has three degree-completion programs that adult learners can complete entirely online. The Bachelor of Applied Science is open to students who have an Associate of Applied Science and allows students to transfer the technical credits that are not accepted in many traditional degree programs. Students in the B.A.S. program work with an academic adviser to design their own program of study to meet their career goals. Instead of devising their own curriculum, students can choose a set track in health care management. Students is this degree program are allowed to take courses from other Indiana University campuses and receive credit for them. The Bachelor of General Studies is a multidisciplinary program that requires students to take coursework in three broad learning areas: arts and humanities, science and math, and social and behavioral studies. The program is open to adult students who have some college credits and to more traditional students who want an alternative path to completing their degree. Students may transfer old credits and receive academic credit for military training, exams, and training courses. The third program is an online RN to BSN program nurses can complete in one to two years. Bethel College Indiana offers a variety of online degree-completion programs for adult learners, and it also has online master's degree programs in education and business. Adult learners working on an undergraduate degree may be able to gain academic credit for things they have learned on the job or through life experiences; the college uses a prior learning assessment that allows students to provide written documentations, pass exams, or provide transcripts. Undergraduate degrees are offered in business, behavioral and social science, and interdisciplinary studies. Students who enter the online MBA program may be able to earn the required 36 credits in about two years by taking one seven-week course at a time. MBA applicants should have a 2.5 or better GPA on their undergraduate work and at least two years of professional experience. Students may enter the program at the start of any course. Students seeking the Master of Education can specialize in literacy, school leadership, or generalist. Bethel also has an online Master of Arts in Teaching, designed for college grads who didn't study education and who now want to transition to a career as a teacher, and Master of Arts in Counseling. Valparaiso University offers several online degree programs for graduate students, including a master's program in humane education that Valparaiso says is the only such program of its kind. Students in the program can earn a Master of Education or Master of Arts, or they may take just the 15 credits of core requirements as a concentration in another degree program or to earn a graduate certificate in the subject. The humane education program is entirely online except for two required residencies, which each last a week, held at the Institute for Humane Education headquarters in Surry, Maine. The curriculum offers a unified course of study that looks at the relationships between human rights, animal protection, and environmental preservation. Valparaiso also offers an online Master of Science in Cyber Security that uses realistic simulations to provide students with hands-on training and experience. Another online program results in a Master of Health Administration in Health Care Administration with a choice of specializations: leadership, health informatics, forensic health, or gerontology. The Master of Arts in Chinese Studies has a K-12 teacher track that combines online coursework with a summer immersion program in China. Huntington University offers degree-completion programs in a fully online format geared to adult learners. Classes in the program are in an accelerated, five-week format, and they are delivered asynchronously so students never have to log on at a set time to attend class. Huntington grants adult students college credit for prior learning acquired through work training and life experiences. Applicants who have at least 50 college credits to transfer may be accepted into a bachelor's degree program. Applicants with fewer than 50 credits can enroll in an associate degree program. Programs available online include the Bachelor of Science (B.S.) in Business Administration, B.S. in Human Resource Management, B.S. in Accounting, B.S. in Not-for-Profit Leadership, and B.S. in Psychology. Online students who have few or no college credits can earn an Associate of Science in Organizational Management. Huntington also offers an online option for students interested in entering the field of social work; in addition to taking online classes, social work students must complete fieldwork. Indiana is pretty darn friendly to distance education learners. The Indiana Commission for Higher Education (ICHE) is supporting adult students who want to go back to college. Indiana’s flagship campuses are pulling in some great U.S. News & World Report online rankings. And a number of well-known names are featured in our (truly) Affordable Online Schools section. In our short guide to choosing an online program in Indiana, you’ll find info & links to all these efforts, plus some advice on avoiding unaccredited or poor quality programs. The Indiana College Network (ICN) is intended to help students enroll in online programs at a large number of regionally accredited Indiana universities. You can use the website to search for online courses in Indiana or search for online programs in Indiana. As well as every level of degree, the program catalog includes online certificates, licensure programs, and Continuing Education (CE) offerings. ICN also has useful advice for high school students and details about admission & registration procedures. ICN members include Ivy Tech Community Colleges, Indiana University campuses, Purdue University campuses, Indiana Tech, and more. View the complete list of participating Indiana institutions. Ivy Tech Community College of Indiana is the state’s regionally accredited community college system. You can use the Ivy Tech Online section of the Ivy Tech website to search for 100% online associate degree programs by subject (e.g. Accounting, Business Administration, Computer Science, etc.) and distance education programs that incorporate a mix of online and video instruction (e.g. Paralegal Services). Each program page has a helpful section on transfer partners, details about credit hours, and info on subject-specific accreditations. Indiana University (IU) Online has its own website devoted to IU distance education degrees. Whether you’re considering a single online class at IU or a 100% online degree program, this is the place to find the answers. Even better, IU Online Class Connect (IUOCC) allows a student enrolled at one IU campus to register for an online class offered at another IU campus without having to go through intercampus transfer (IU recommends you check with academic advisor to make sure your course credits will count toward your degree). If you’re seriously thinking of IU, this site has a fair amount of advice and resources. For instance, it talks about procedures for pursuing out-of-state licensure and ways for online students to seek financial aid. There’s also a convenient Credit Transfer Service to help students see how courses from another college or university will transfer to an IU Online program. Run by the Indiana Commission for Higher Education (ICHE), You Can. Go Back. is designed to help Indiana adults with some college credits—but no degree—finish their education. Under this initiative, the Indiana colleges and universities are encouraged to offer special programs (e.g. online completion programs), credit for military & work experience, scholarships, discounts, and state grants to adult learners. Just to take one example, Ancilla College has all kinds of You Can. Go Back incentives, including a tuition freeze. You’ll find more detailed info about this program in Learn More Indiana‘s section on adult learners, including answers to FAQs about potential careers, costs, and college choices. This website also has clear advice on how to transfer credits. Can’t find what you want in-state? Indiana is part of the Midwestern Higher Education Compact (MHEC), which runs a reduced tuition student exchange program called the Midwest Student Exchange Program (MSEP). Indiana students enrolling as non-residents in certain programs at MSEP campuses may be eligible for a tuition discount. Thanks to its world-famous Kelley School of Business, Indiana University – Bloomington frequently hogs the #1 or #2 spot for Best Online MBA Programs and Best Online Graduate Business Programs (Excluding MBA). It also often lurks in the Top 50 of Best Online Graduate Education Programs and Best Online Bachelor’s Programs. Ball State University is competitive in many of the same categories. It’s usually in the Top 20 of Best Online MBA Programs and the Top 25 of Best Online Graduate Nursing Programs. In 2018, it was #35 in Best Online Bachelor’s Programs. Engineering is a key strength at Purdue University – West Lafayette, with a #5 finish in Best Online Graduate Engineering Programs in 2018. Its College of Engineering boasts a number of famous astronaut alumni, including Neil Armstrong. Some of these schools may not appear in our section on Affordable Online Schools, but that doesn’t mean they’re beyond your means. Always ask what’s available to low-income students. To be deemed an Affordable Online School, these schools had to meet some pretty tough criteria for quality, flexibility, price, and use of financial aid money. (You’ll see a CAG score next to their profile in our ranking). If you’re debating a pricier option vs. an affordable option, check out each school’s profile on College Scorecard. This will give you useful long-term stats like graduation rates and average debt loads. Ball State Online has a handy catalog of all BSU’s online programs and a comprehensive breakdown of tuition costs. According to BSU, 75%+ of its students, including online students who continue to work full-time, receive some form of financial aid. Students in western Ohio counties who are pursuing a bachelor’s or graduate degree may qualify for in-state tuition; senior citizens and BSU employees & their families also receive a tuition discount. What’s more, online students can choose to pay their bill in installments (the Deferment option). We’ve already mentioned BSU’s super-strong U.S. News & World Report online rankings, but it’s worthwhile noting its financial appeal to veterans. In 2016, it had Top 10 finishes for Best Online MBA Programs for Veterans and Best Online Graduate Education Programs for Veterans and was #20 in Best Online Graduate Nursing Programs for Veterans. Every year since 2010, BSU has been labeled as a “Military Friendly” school by G.I. Job. The Office of Veterans Affairs has further about benefits. Bethel College’s website section on Online Learning is the first place to go for info on its distance learning programs. This contains details about tuition costs & financial aid options for adult students and graduate students. Bethel has a Prior Learning Assessment (PLA) program that allows students to earn a maximum of 30 credits through written documentation, exams (e.g. CLEP), and evaluated programs (e.g. ACE). It’s also a Christian college, and aid includes programs like a Church Matching Scholarship for full-time undergraduates. IUPUI’s Online Classes and Programs are offered in 100% online and hybrid formats. Specifics about online degree programs are available through IU Online or the program website. For example, the School of Liberal Arts has a list of scholarships open to Bachelor in General Studies (BGS) students. The Office of the Bursar has details on tuition & fees. It’s worth noting that IUPUI is often in the Top 50 of U.S. News & World Report rankings for Best Online Graduate Nursing Programs. In addition to a number of online graduate programs, and an online RN to BSN degree completion program, IUPUI’s School of Nursing also offers online professional development courses (e.g. Nursing Informatics) through its Center for Professional Development and Lifelong Learning. These courses are intended to keep nurses up-to-date in the latest healthcare advances. This private Roman Catholic school has a list of all its Online Programs on its website, but adult undergraduates should visit its separate section for Marian’s Adult Programs (MAP). This has the rundown on the school’s online & accelerated associate and bachelor degrees, including details on Admissions requirements and MAP Tuition & Fees. Graduate Tuition & Fees will depend on your choice of program. The Financial Aid section has the rundown on scholarships. Always make sure that your school is fully accredited by an organization recognized by the U.S. Department of Education. Although national accreditation applies to distance learning institutions (including for-profits), regional accreditation is the gold standard—especially if you’re trying to transfer credits or seek financial aid. The Higher Learning Commission (HLC), once known as the North Central Association of Colleges and Schools, is in charge of regional accreditation for Indiana universities and community colleges. The homepage makes it easy to search for HLC-accredited institutions by state. The “Public Disclosure Notice” under the school name will tell you if the institution has been placed on notice, sanctioned, or put on probation. Looking at online degrees in other states? You can check any institution’s regional or national accreditation status using the Council for Higher Education Accreditation (CHEA) Database. A number of Indiana schools with religious affiliations are completely unaccredited. And even regionally accredited universities with online programs can experience academic difficulties. Here are some universities to do your research on before you commit. Hyles Anderson College is an unaccredited private Baptist college. It holds no national or regional accreditations recognized by the U.S. Department of Education and does not appear in the CHEA Database or College Scorecard. According to sources cited on Wikipedia (e.g. Chicago Tribune), the school has a history of issues and scandals, including an ex-chancellor who pleaded guilty to child abuse. Martin University is regionally accredited, but it was placed On Probation by the HLC in February 2014 because it was no longer in compliance with a number of criteria for accreditation. HLC had concerns with faculty, student retention, persistence & completion, governance, and administration. This Probation period lasts for two years and the institution remains regionally accredited while it addresses HLC concerns. College Scorecard reports that Martin has a very low graduation rate and an extremely low percentage of students paying down debt within the first three years of leaving school. MDIVS is an unaccredited online religious university that holds no national or regional accreditations recognized by the U.S. Department of Education. It does not appear in the CHEA Database or College Scorecard. Saint Joseph’s College is regionally accredited, but it was placed On Probation by the HLC in November 2016 because it was out of compliance with a number of criteria for accreditation. HLC had particular concerns with criteria related to resources, planning & institutional effectiveness and teaching & learning (including quality and evaluation). This probation period lasts for two years and the institution remains regionally accredited while it addresses HLC concerns. On the other hand, College Scorecard reports strong financial and academic data for the college. University of Phoenix is a for-profit institution headquartered in Arizona. It is regionally accredited by the Higher Learning Commission (HLC), but it has been subject to a number of lawsuits over the years. College Scorecard reports that the Indianapolis campus has an extremely low graduation rate, a low percentage of students who return after the first year, and a lower than average percentage of students paying down their debt after three years. Higher Learning Commission (HLC): Formerly known as the North Central Association of Colleges and Schools, HLC is the regional accreditation body for Indiana universities and community colleges. Use its website to search for HLC-accredited institutions by state. Office of eLearning: Run by the Indiana Department of Education (DOE), this Office is devoted to improving Indiana student outcomes through the intentional use of technology. It works on a variety of initiatives with education partners and supports a number of professional development opportunities for teachers & administrators. Transfer Indiana: This website explains all you need to know about transferring credits to an Indiana college or university. It has tips, tools, advice for high school students, military, and adult learners—the list goes on! You Can. Go Back: This is an Indiana Commission for Higher Education (ICHE) initiative that’s intended to support adult learners who want to go back to college and finish their degree. Many Indiana universities and colleges, including Ivy Tech, offer special programs (e.g. online degree completion programs) and financial incentives to students. Ask your school if it participates. Indiana College Network (ICN): Use ICN to search for online courses in Indiana or online programs in Indiana that are available through ICN member institutions. IU Online: Use this website to locate a single online class or a 100% online degree program in any of IU’s campuses. Ivy Tech Online: Use the Ivy Tech Community College of Indiana system website to find 100% online associate degree programs offered through Ivy Tech.